Hey I had this app before and it helps you to be brave so please do download this game and it will really be a great app for your kids and friends. Both my kids love this app! They are 2 and 6. But I am having an issue with the update... As in it will not update. Not sure why. Other than that everything is great. I loved this book as a kid and now my son gets an even better version of the book. This was my children's favorite book 30 years ago. Now I do daycare and the kids just love it. As does my granddaughter. It's a worthy purchase. OMG, I am in love with this! I loved the book when I was younger and it works beautifully as an interactive book. The creators did such a good job and my two year old laughs hysterically at every page. Definitely worth the price. Other ebook creators should study this book to see what a successful app should look like. My 3 year old loves this!! A rare, rare instance of an app not only being better than the original book, but bringing it to a new level of excellence and interaction. (And as a young child many years ago, I *really* liked the book!) Honestly, this application is perhaps the pinnacle, a shining example of how to improve something by utilizing the basics of the iPad. It brings out a whole new dimension that the book hints at, but could obviously never achieve. Genuine kudos to the developers and Sesame Street for bringing such a great product and setting new standards for our children. My 2-year-old toddler loves this book app, and is easily the one he opens the most. My 2 year old goes wild for this book/app!! He laughs so loud at Grover, and turns the pages and interacts all by himself. Love Love Love it! When I saw the last photo that says 'hours of interactive fun', I assumed this was like Captain Underpants, where they had added games and puzzles. They did not. The interactivity is limited and you will see all there is to see within a few minutes. I still love the book, but that was an advertising lie. It's so interactive!! I loved this book as a child and now my daughter can enjoy it more than I ever did!! My grand kids really like this Ap due to the interaction with the story. I have submitted a refund for this app that was a complete disappointment. 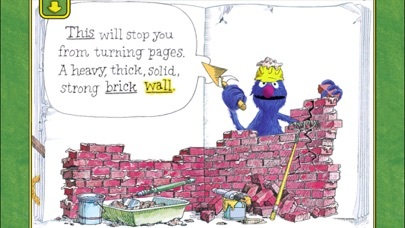 We kept waiting for Grover to tell us when we could turn the page. I don't think it is cute or funny to "disobey" him when he tells us adamantly not to turn the page. What I thought would be a challenging opportunity to help Grover and my son allay fears, help him with some reading skills, or problem solving unlocking the pages, was a total waste of my money. And to only be 12 pages long!! Very fun book that my kid enjoyed, but the are only 12 pages in it. The book was finished in 5 minutes. Maybe 1 dollar, but absolutely not 5. No way. Three year-old reviewer: it's great! Thank you for showing us your book. I liked the end of the book, and I liked the stuff where you touched the lightening and made it move. My favorite page was where I was taking down the wood. Silly old Grover! This was a favorite of mine when I was younger. My daughter is only 16 months and she LOVES this book! It is very interactive and better than the book I had as a child, she laughs so hard and it brings a huge smile to my face. Definitely worth the money. My 2.5 year old LOVES this app/book and laughs hysterically. Downloaded the sequel today. Definitely recommend! My 2 year old loves this app! He looks forward to it every night. We read it together and then he kisses Grover on the last page, says goodnite and falls asleep. Glad to see the end not be the end! My kids and I loved this book as much as the first. Sometimes they want to hear me read it, but usually want to hear Grover and Elmo talk. The first book was great, and the second is too. The interactive options allow the reader to decide just how closely he or she will stick to the original words. Highly recommend the app! Very unique, fun, but the story is little bit short for the price.. I enjoy this app with my daughter, ever since she was 2! We use the book for a reward in our classroom. Grover is an inspiration and such a big help in our Special Needs class. Thanks Sesame Street! When I was a kid, I loved this book. Then in college, I was a pre-school teacher, and those kids loved it too. Now, I'm an ESL teacher overseas, and when I saw there was a digital book, I had to have it! Since I bought this book, some of my young students have read it dozens of times. I let them choose one or two books at the end of the lesson and this one is always at the top of the list. I have just bought the sequel, and look forward to sharing it with my kids. I hope there will be many more to come! This has been a favorite book of our family for years, and I never thought we could like it more-but this app really does the story justice! My one year old plays it every day. My 4 and 9 year old enjoy it also. My husband and I grew up with this book and were enamored by this app. Even still, my nieces and nephews cannot get enough of the inacteractive story. This is an amazing app. A bit buggy at times but, the two little girls I got this for love it and that's all that matters. Great app! Keep up the good work. My 3.5 yr old loves this book the best of 20 + I have downloaded for her across dif apps. It's interactive, silly fun, and my child can select it and have Grover read it to her without my help. This is just a great book. 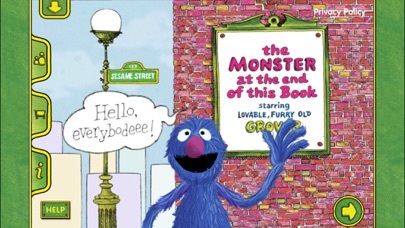 My mother used to read this book to me when I was a kid and she did a very convincing Grover. Now I can let my kids read this and still enjoy it myself. (Of course I don't have to mimic Grover and make my voice hoarse.) Over all a great book all together. Highly recommended!!! Love, love, love this app. Well worth the money. My little one loves playing along with Grover. A great interactive book. My six year old loves it. Both my 4 and 9 year old nieces love this app! It's very well designed and keeps them laughing!! Nice app although I wish it would not start from the beginning every time my daughter hits the home button. My daughter kept reading the book over and over. She loved it! A couple of the voice segments overlap a bit. But otherwise works fine. 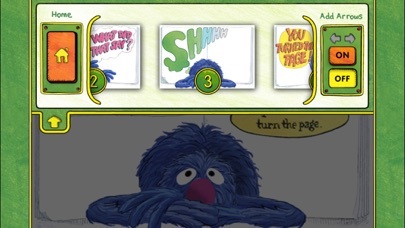 I would like the option of turning off Grover's voice so I can read the words. If you turn the page, there will be a monster at the end of this book called Elmo & Elmo is not lovable. Yes, he is SCARY. Very very scary, oh yeah😈💩 - roar Elmo roar forever no more silky loving & no BIG hugs no kisses just roaring & saying boo & scaring. Oh, from 2003 Elmo started to love the viewers since 2003. A sent of Elmo Monster (Scary Monster) just roars along forever until August 2014 then back to loving again. Loved it as a kid and my son loves it now! This was one of my favorite books as a kid and I downloaded the first version on my iPad 1 when my son was 1 year old. Three years later, it is still one of his favorite apps and gets played frequently. I will warn though that it is important to "read" it together a few times before letting your child play it on his own. It can be too scary, otherwise. Calloway makes some fantastic apps and this is one of them. No longer works on iPad 1.. Same goes for the other monster book. It would be nice if there was an option to read through the book without the animation/audio as well. This would help children learn to read from the book (as it was originally intended). This was my favorite book growing up, and I'm very happy that it is now available on the iPad. Please tell me you will be updating this app to 64-bit soon. It will be terribly sad to see it no longer work after iOS 11 is released. We bought this (the original) after the second book with elmo, and he loves that too. They both are based around the same plot but have different activities so he is still interested. I'm happy with the purchase as is my son. He reads it every night. Just downloaded app with iPad 1 OS 5.1.1 and it won't open. I hope this is fixed soon! It is a classic Sesame Street book and we have the both the physical book no this digital version. I had basically given up that this was ever going to be updated, as they had last done an update in 2014. I am glad that it is now iOS 11 compatible. Monster at the End of This Book. Yeah!!!! It's super cute and Grover is such a lovable monster. Great interactivity. Funny too! The book is only a few minutes long but my three-year-old is in love with it!!! He still cracks up every time he watches Grover. My son has gotten many hours of enjoyment out of this one. Well done! My 18 months old boy loves it. Fun to play with him. A classic kids book, made even better. Easily one of our favorites, Grover is great!! This app runs great on my IPhone 5s, but not on my ipad3. 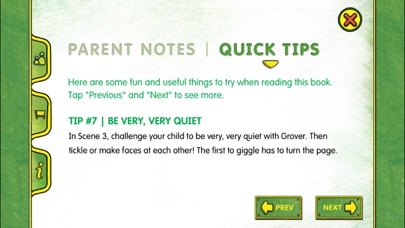 the words overlap and are out of sync with grover's mouth to the point that it is hard for my son to follow. Sometime the first line gets cut off by the start of the second line and is very annoying. As others have said the brick wall is especially bad and sometimes just falls on its own without completing the words. Hoping they can fix the problems because my son loves the book and loves the ipad! I have a 5 year old daughter with down syndrome. This is her favorite app, and she squeals everytime she sees the iPad: "Mooonster!" We never get tired of this application. As a programmer and web designer, I never get tired of its complete perfection in design. Initially I was annoyed that you had to wait for the page to be read before any further action could be taken, but after thinking about more was glad that my daughter had to wait and couldn't just start poking at everything. It's filled with surprises and little gems that make it interesting on multiple rereads, and is truly just a beautiful application - easy to use, entertaining, and the perfect amount of silliness. Thank you for all the effort and thought that went into making this. Was great. Now the voices aren't synced and brick level falls before my girls even touch the screen. They do not understand why (not to say that I do either). No longer launches on iPad 1. Exits to home screen after a second. My kids cannot get enough! My son and I love this book. He has memorized all the words and loves it still. Definitely recommend ! I am pretty scared of it! I hope it is gone! I loved this book when I was young and thrilled to share the animated app with my son. It's so well done! Ad? What ad? There's no ad. I thought maybe they'd updated the app but I just checked & no ad. I know some kids apps need the $ but I'm glad this one is staying pure. It's a favorite of our niece and our family. This app didn't try to rewrite what has always been a favorite on our bookshelf. It's a really faithful version that feels true to the intentions of the writer. Just a really sweet and funny interplay with Grover, with only enough bells and whistles to keep her focused on the story. It makes her laugh every time, a giggle that I can't get enough of. A good segue for us from play and TV watching (Frozen for the 1000th time) to our bedtime book. A ritual that's still paper, by the way. The only reason I gave it two stars is because the new version has some bugs compared to the older version. For example there are a few pages where the voice and words are no longer in sync. The brick wall is now collapsing by itself without at tapping or tipping the ipad. Otherwise I give it five stars. When I was a kid, I loved this book. Now the child in my life is captivated by the story as well, only his experience is enhanced with animation and sound effects! Thank you so much for updating this app to work with iOS 11. I'm glad we can continue to enjoy it together. 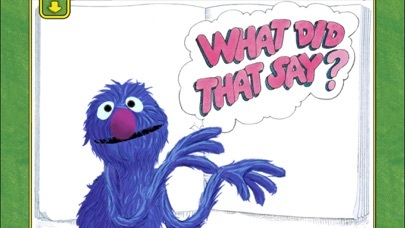 My 3.5 year old listens to instructions and/or gets scared too easily because he would not turn the page when Grover said not to turn the page. Attempted to do it together and he refused; however, he did stare at that one page for about 10 minutes watching Grover be scared of turning the page. My kids love this app. Especially my 2 and 5 year old. Great way to have interactive reading time with my kids. I loved this book growing up, and my son loves the interactive version. Especially smashing down the brick wall. The only problem with it is the ad at the beginning. The book was a family favorite and the fun is continuing with my grand daughter, couldn't be more pleased, she is one year old and loves it. Great book became a great little app! Fun and imaginative, my four year old son reads/plays this book over and over. Bought it worked fine, new update makes it crash on launch. Please update for the new iOS! This is one our kids' favorite apps and it doesn't work anymore! This was one of my favorite books as a kid and now I get to use this to put my son to bed and we still laugh every time. The app itself is great. My two year old loves reading her "book" and giggles every time she tears down the brisk wall. I do not like that the app has an advertisement for Roku when I payed $5.00 for it. Loved this app before the update. Now it won't work on my first gen iPad. My kids are extremely disappointed. My 16 month old loves. We enjoy reading it together - just the right length to keep his attention. I loved this book as a kid but always wanted a way to make turning the pages like it was in the pictures. This app does that. This is what reading apps are for! My daughter laughed so much. Totally worth it. Ads! In a $4 kids app!? This is a great app and my kid loves it but there's a shopping cart icon on the main menu (which is marginally acceptable) and now there's a splash ad. Totally unacceptable for a paid app., more unacceptable for a kid's app., and still more unacceptable for a CTVW app. Someone in your marketing dept. has a bit too much power (and a poor sense of propriety) if this kind of thing is getting through. Seriously who thought it would be a good idea to advertise to 2-4 year-olds. Like this. I remember reading this book to my younger brother growing up. I was so excited to see it is now in an interactive app. My 2 year old reacts to every page. I don't usually get paid apps but I couldn't turn this one down. My son loves this app, he a big fan of Grover. Only problem I have is with the update the app has some glitches. Overall a lot of fun! 2 and 4 year old love it!! I am so thankful for this one! My 2 year old son and 4 year old daughter both love this so much! I always liked the booked so I didn't hesitate to download this app. I knew the kids would like it, but not as much as they do! I highly recommend it! These apps are not updated and don’t work. Was a five now should have no stars. Updated and working again. Looking forward to sharing this with my students again. At some point this app got updated to include ads, which have been placed directly over the corner to turn the page. Used to be my toddlers favorite app. Now he can’t play it because all he does it touch the ad.